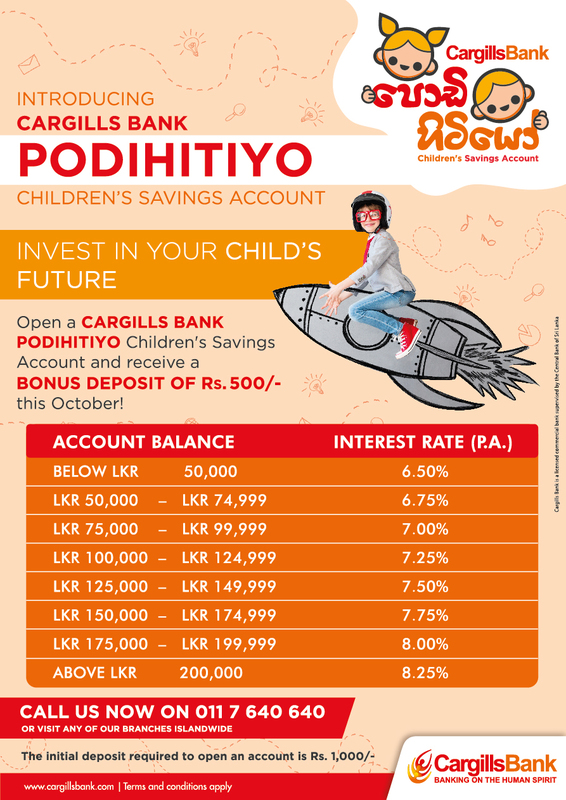 Cargills Bank unveiled the new ‘Podihitiyo’ Children’s Savings Account on World Children’s Day, offering the industry’s highest interest rate for children’s savings accounts with an incredible interest up to 8.25%. p.a., striving to create a culture of savings amongst the community, a Media release stated. The product is specifically designed with slab-wise interest rates between 6.50% – 8.25% (p.a.) giving varied returns as well as flexibility on the investment. Commenting on the launch, Buddhika Perera, Head of Retail Banking at Cargills Bank said, “We are pleased to launch our new ‘Podihitiyo’ Children’s Saving Account, with a broader focus to exceed our customer expectations. “Today, people’s lives have become tight with work and other commitments. Thus they fail to maintain a consistent and frequent pattern of savings for their children. The Bank has attuned to customer convenience by enabling access to make deposits to the ‘Podihitiyo’ Children’s Savings Account from over 370 Cargills Food City outlets island-wide, which are open from 8.00 a.m. to 10.00 p.m., 365 days of the year. Our rationale is to build a ‘savings habit’ among the community by creating an innovative avenue for customers to save for their children while they do their grocery shopping,” he further added. The bank is offering an added bonus of a deposit of Rs 500 for each and every new ‘Podihitiyo’ Children’s Savings Account which would be opened during the month of October as a promotional give away. The motive is to encourage parents to open accounts and enjoy the highest yields on their child’s long-term savings. A minimum deposit of Rs 1,000 is required as the customer contribution to open an account. These accounts could be opened for any child under age of 16, the Media release concluded.